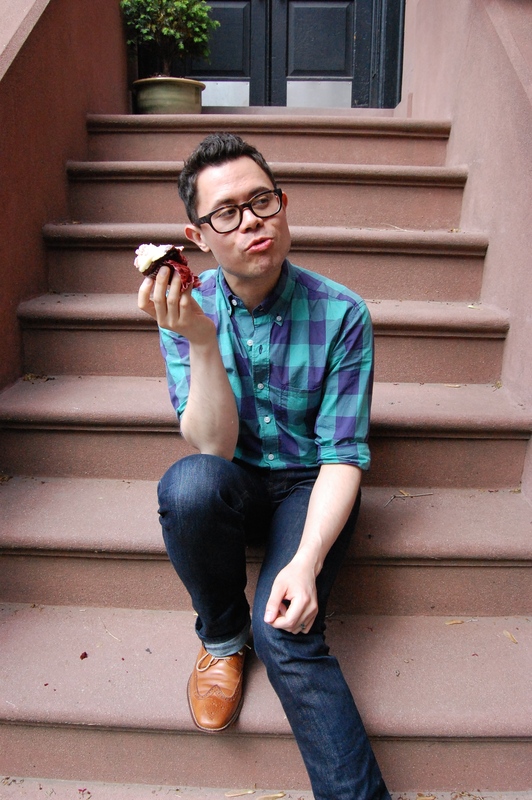 Mike is an illustrator, author, graphic designer and cupcake connoisseur. His debut picture book Little Elliot, Big City (Henry Holt Books for Young Readers) releases August 26, 2014. Mike has a range of creative experience, from layout, packaging, logos and branding, to drawing, painting, and digital illustration. You can find him on any given day walking around the city and eating a cupcake (or thinking about it). I found your blog last week, and I must say, I am impressed and proud. You have come a long way since your cross-country days, and really have developed as an artist! Congrats on finding an agent- I hope this really works out for you! I am equally proud of my old neighbor (your mom) and how well she has done raising an awesome family w/your Dad. i have 3 children, Cooper ( 6 1/2 -1st grade) and Molly & Finnegan(they turn 5 in may). They all love books and drawing, and Cooper especially is a fan of Mo Willems and Mem Fox. In fact, he is saving his ($68.35 to date) so we can go to Australia because that’s where Mem Fox is from. Of course, when asked if we can go, I never say no,but, lets work on it! Anyway, I hope that soon he will have a new favorite artist,one we could possibly even meet! Thanks for saying hi! Glad to hear everyone’s well. Hope Cooper gets that trip to Australia! I really enjoyed reading your blog and this page. I have been a sculptor for many years, and recently moved into writing children’s books, so I appreciate your fresh leap into the blogesphere ( I think that I just made that up, or just read it). I am also learning, investigating, and experimenting with illustrating my stories. There is a brain re-programming necessary from three to two-dimensional design. Where can I find that Photoshop tutorial? I was told that Photo CS5 and a tablet like Wacom are good tools to start with, but I am aware of needing to educate myself before I buy them. Anyway, the best of luck to you. Your work is charming and inspiring. I was also at the SCBWI conference. What a way to enter this field! I love your work! It’s gorgeous. Sculpture absolutely boggles my mind. I can definitely see storytelling in your work, so I’m sure it will translate really well to children’s books. Not sure they have the photoshop tutorial you’re looking for (I myself am still waiting for “How to Have It All and Look Good Doing It”), but you should check out Lynda.com. They have great video training resources. Thanks for the reply. Since I first wrote, I have been reading more of your blogs and met Elly (nice to meet you!). I also found a photoshop class from mediabistro. This is an enchanting and exciting world! Mike, Elliot makes you feel like you matter. Adults, like myself, whose childhood was ruined by a child molester, still have self-worth issues. We can see Elliot as our childhood selves feeling small, but still hopeful. I love Eliot and your work is amazing. Funny how I found Elliot, I go to thrift stores because I love searching out small treasures, too, and found an Elliot tote bag, bought the beautiful tote, and when I got home went searching on Google. i have been lucky enough to be at book expo and get your books for my grandchildren, who by the way love your books, will you be at book expo this year and if not where can i get the book autographed. Thank you! I will be at Book Expo on Thursday, June 1, autograph table 14 from 9:30 to 10:30AM. I’ll be signing free hardcover copies of All the Way to Havana, written by Margarita Engle. Hope to see you there! Little Elliot, Fall Friends is coming out August 29th. There will be free signed prints available for the book at the signing table, but no books, sorry. Fall Friends will not be available until August 29th. I am happy to sign any other books you’d like me to sign.